Over the last couple of decades the UAE has become a hotspot for international talent from all around the globe. The wealth of the country combined with its dedication to luxury has resulted in a diverse workforce, employing some of the most brilliant minds from around the world to develop their private and public infrastructure. It is no surprise then that the UAE is very strict on their acceptance of foreign nationals into their society. If you are considering the UAE as your destination for your next job, as a new market to expand your business, or to pursue your studies at one of its prestigious institutions, you will need to provide a variety of different documents. These include documents such as university degrees, birth certificates, marriage certificates, death certificates, certificates of incorporation, certificates of origin, commercial invoices, corporate power of attorney, corporate resolutions, and tax residency letters. However, documents issued outside of the UAE cannot be used in the UAE until they have gone through a process of validation. This process is known as attestation in the UAE, apostille in many other countries, and as authentication and legalization in Canada. 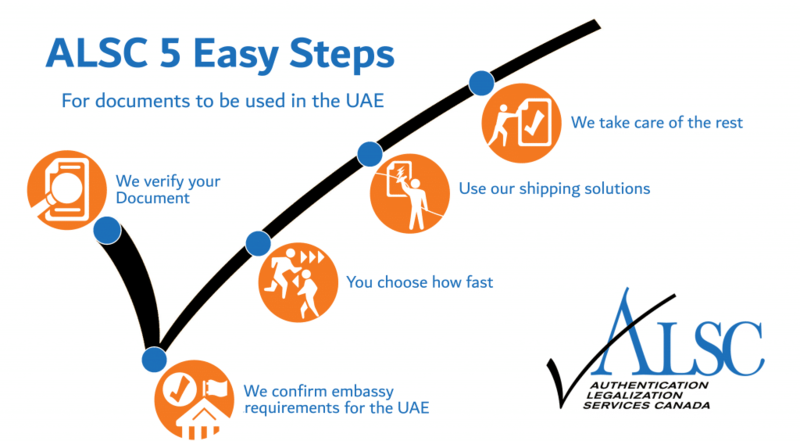 If you have a document that needs to be used in the UAE, you will have to go through one of these three processes. In this case, your Canadian documents will require authentication and legalization. At ALSC, we have over 25 years of experience working with Canadian documents for use in the UAE. 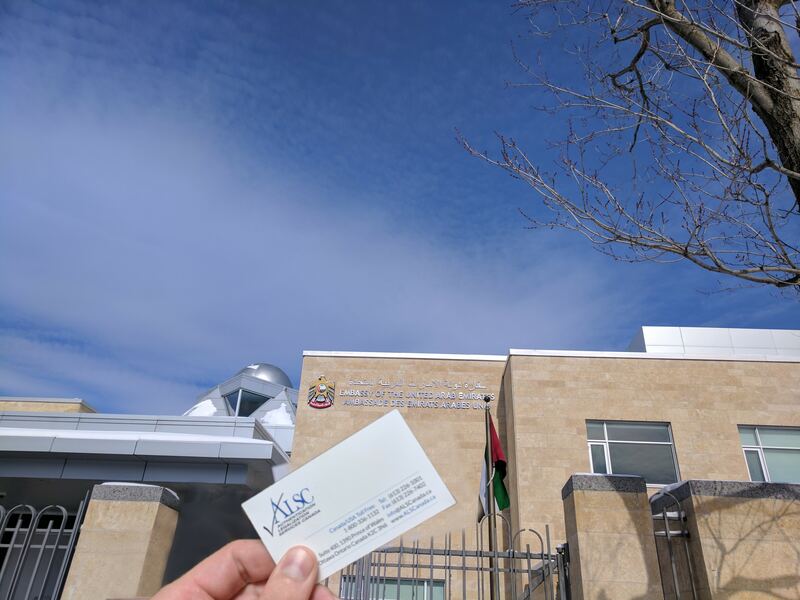 We have helped thousands of clients with both their personal and corporate needs and have developed unparalleled relationships with the UAE Embassy here in Ottawa and the UAE consulate in Toronto. We can have your documents authenticated at Global Affairs Canada as soon as they arrive at our office on our priority service and have them legalized by the appropriate UAE embassy or consulate within days. This can save you as much as 20 business days since Global Affairs Canada usually takes 20 business days to authenticate documents received by mail. It can get even more complicated as the fees for legalization change almost every month at each UAE embassy. This is in addition to the other requirements they have which are often extensive, especially for educational documents. The UAE also has various jurisdictional rules depending on where the documents you have were issued and it’s not always clear which embassy they need to go to. It’s no surprise then that authentication and legalization can take months to complete. If you have Canadian documents that need to be used in the UAE and you are rushing to meet a deadline, we recommend you contact us immediately. Once completed we can ship your documents anywhere in the world with our trusted shipping partners. If you are in or near Vancouver, Victoria, Surrey, Calgary, Edmonton, Regina, Winnipeg, Toronto, North York, Mississauga, Halifax, or Montreal, you can drop off your document at one of our service centers after you’ve made an appointment with our head office. Our service centers save you a trip to the post office and provide you with free priority shipping for your documents upon drop off and pick up. In the meantime, let’s go through some details about some Canadian documents for use in the UAE. Degrees are some of the most valuable documents you will be given in your lifetime. This is particularly true if you have a degree from internationally recognized institutions. Canada has many of these, including the University of Toronto, McGill University, Queen’s University, and Concordia University. However, the prestige of these degrees makes them a target for forgery; for people to make fake degrees from these universities to attain unqualified employment. To combat this the UAE has some of the strictest requirements surrounding degrees. Most degrees contain signatures that are recognized by Global Affairs and are therefore ready for authentication and legalization. However, original degrees and transcripts, even if they are authenticated, will not be accepted at any UAE embassy without accompanying materials from the university. If there are any discrepancies at all in the information in the documents provided by yourself and by the issuing institution, your documents will not be accepted. This standard, among others, is what allows the UAE to provide some of the highest quality education in the Middle East and create some of the most advanced infrastructure in the world. Unfortunately, this can make the process very frustrating without assistance. If you have any educational documents issued in Canada, whether they are Canadian University Degrees, Canadian Diplomas, or Canadian Transcripts for use in the UAE, we strongly recommend you contact us. If you need help getting your Canadian university degree, refer to the useful links below to order your Canadian university degree. Many of our clients have their degrees shipped directly to our office to save them even more time. We recommend you do the same if you are on a deadline! Click below to get a new degree if yours has been lost or damaged. Canadian vital statistics documents such as birth certificates, marriage certificates, divorce certificates, and death certificates are often required in the UAE for family matters of all kinds. A few reasons why you may need these documents are: to bring your family or spouse with you from Canada into the UAE, declare your single status in the UAE, or to handle estate matters concerning relatives in the UAE. Since all vital statistics document contain signatures that are recognized by Global Affairs Canada, they do not require any additional processes such as notarization. In short, they are good to go. Unlike degrees, vital statistics documents rarely have additional requirements and are easily verified by consular staff at the UAE. Canadian vital statistics documents are easy to get if you are having difficulty finding yours. If your existing vital statistics documents are in poor condition, it is likewise a good idea to order new ones especially since some of the newer vital statistics documents are made from more durable materials. Note that documents such as marriage certificates and death certificates which are not issued by the provincial government are not valid for authentication and legalization. All documents concerning life events like birth, marriage, and death, must be issued by the provincial government. If you need to order your birth certificate, marriage certificate, or death certificate from your provincial government, refer to the links below. Other documents which are not issued by vital statistics but also critically important are doctors notes and letters regarding prescription medication. This is something often overlooked by people going to the UAE. These documents will require notarization by a lawyer or notary public. Luckily, we can help you with this when you use our services. Understandably, documents related to medical conditions are extremely important and cannot be forgotten or delayed. Our service guarantee ensures your documents will be recognized in the UAE, regardless of the document. When you use our service you can rest assured knowing that your personal affairs, whether family related or otherwise, will be addressed without delay. As one of the most rapidly developing countries in the Middle East, there is no shortage of business opportunities in the UAE. Whether you are an existing business looking to expand or modify your existing subsidiaries, renew existing contracts and licences, or a new business with the hopes of expanding your markets to the UAE, we can help you make your Canadian corporate documents valid in the UAE. Our professional staff provides you with an unparalleled service tailored specifically for those working in the business world. We have over two decades of experience handling corporate documents such as certificate of incorporation, certificate of origin, commercial invoice, certificate of pharmaceutical product, GMP certificates, certificate of amalgamation, corporate resolutions, and tax residency letters. The documents you will need will depend on the purpose of use. You will have to get this information from the requesting party in the UAE. Many of the documents you will need are issued by federal bodies such as Industry Canada. These documents will require notarization prior to authentication and legalization which we can do for you when you use our services. If you are exporting materials to the UAE you will also need to have the accompanying documents authenticated and legalized. These documents can be signed by your local Chamber of Commerce once their requirements are met, after which point they are ready to be processed for use in the UAE. Alternatively, the Canadian Chamber of Commerce has a “Certification Made Simple – TradeCert” service which can certify your Canadian Certificate of Origin for use in the UAE. This service provides you with useful forms including a Certificate of Origin Template Canada. As proud members of the Canadian Chamber of Commerce, we are available to pick up your documents from the Canadian Chamber of Commerce here in Ottawa free of charge. You can also send us your completed forms via email to save time. If this is something you are interested in doing, let us know when you contact us! Getting your documents ready for use in the UAE can seem overwhelming even if you’re not new to the process. Constantly changing fees and requirements at the UAE embassies and long, uncertain processing times at Global Affairs Canada can make authentication and legalization a nightmare. Thousands of people go through this process every year to address their affairs in the UAE, but few manage to make it on time without assistance. As our testimonials show, we are the best in our industry. The strong relationships we have built with Global Affairs Canada and the consular staff at the UAE embassies here in Ottawa and in Toronto give us an additional edge over our competition and ultimately allows us to provide our clients with the highest quality service possible. When you work with us, you don’t work at all. Our services will save you time better spent with family and friends. Your personal agent will ensure all your questions are answered and that you are left with no concerns. We will take care of every detail and provide you with ongoing updates every step of the way. Click below to get started and see just how easy we make it! Click below to get started with the UAE Authentication and Legalization Specialists.